I built my last balloon nine years ago using a borrowed Adler sewing machine. 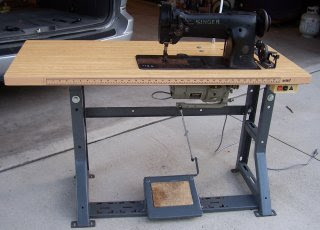 I've wanted a sewing machine myself, but have found it difficult to find one on the used market at a decent price. I've seen a few on the coast, but they are hard to ship. Today my search was over. I picked up a Singer 112W116. It is an industrial-grade sewing machine that can sew two rows of lock-stitch at the same time, 3,000 stitches per minute. I'm not sure how old the machine is, but I'd guess us is older than I am. I need to see if I can get it to working soon. When I built the balloon I was pretty good at setting the timing on a sewing machine and having it run smooth. But I've forgotten those skills and will have to learn again.